Quite a while back, when I first started on my love for EPP, I designed a quilt that still sits on my back burner, waiting to be made. 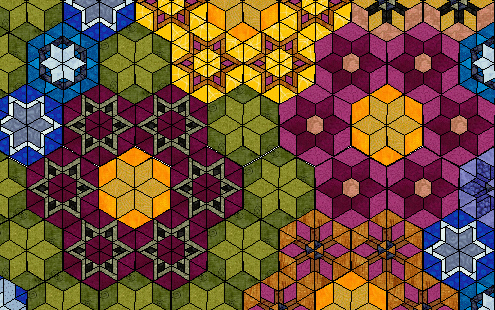 I actually do have a few hexagons sewn, but this is one of those quilts that will probably take years to make. 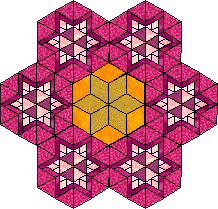 The quilt is based on a gazillion pieced hexies. Take the typical GFG rosette and divide each individual hexagon into at least 12 pieces. 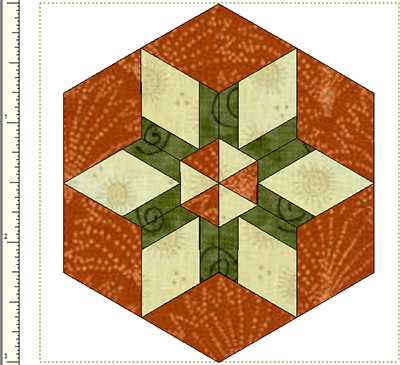 Yes, the most simple hexagon in this quilt consists of 12 pieces. The most complex one has 60 pieces. How about some closeups? 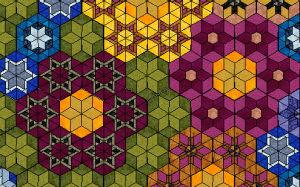 In my calculation notes for this quilt I see it is made up of 1,100 hexagons, based on 10 different hexagon blocks shown below. I averaged the figures to estimate each hexagon block would have around 36 pieces. So yes, that adds up to around 40,000 pieces! Last, but not least, each hexagon measures… 3 inches!!! Maybe I should reconsider that and increase to four inches? That would make for a very large quilt. Or perhaps 3½ inches? 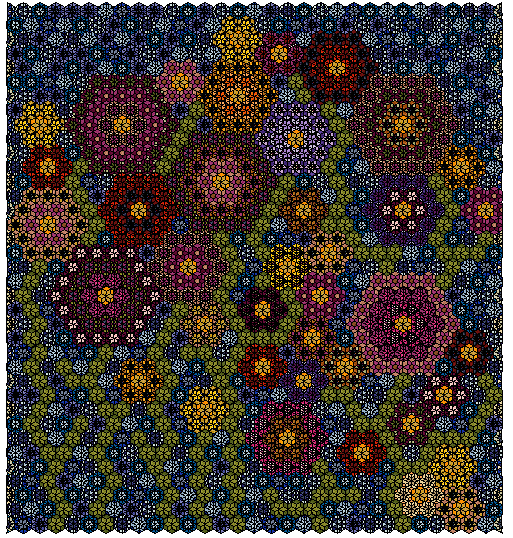 Current size is 78 x 80.” With 3½” hexagons that would increase to 91 x 93″, and with 4″ hexagons to 104 x 106″. Hmmmm…. I named this quilt “Not My Grandmother’s Flower Garden.” Somehow, I think the word insane needs to be included there, too. What do you think?